Darryl Ivy is tough, but not tougher than toxic chemicals used to wipe out large quantities of unwanted weeds. As herbicidal chemicals poured down on him from a helicopter, Ivy took shelter in his pickup truck, only to cough up blood days later. A strong man with a special license that allowed him to transport toxic chemicals, Ivy found a job working for Applebee Aviation in Oregon’s Douglas County to help pay for his wife’s medical bills. For 17 days, Ivy experienced a regular rainstorm of hazardous chemicals. He was smart enough to document the dangerous working conditions, despite the fact that the staff at Applebee Aviation tried to convince him the spraying would not cause him any harm. He provided photos and videos that illustrate the corruption of one company within the timber industry, but without proof, it is impossible to tell how widespread this kind of conduct truly it is. Despite strict regulations that require safety in spraying operations, the chemicals were released on Ivy and other employees. The workers then drove the coated vehicles close to homes, campgrounds, rivers and other inhabited areas. One of Ivy’s videos depicts one of the staff members dipping a bucket ridden with the water-polluting chemical atrazine into a nearby waterway. Spraying or allowing chemicals to drift onto humans is illegal, and workers are not meant to enter into an affected area for up to 48 hours. Worker’s are meant to immediately remove their clothing if coming into contact with herbicidal chemicals, and clean their skin for 15 minutes. These chemicals can cause irreversible damage to the environment and the body. Of the chemicals used during Ivy’s time at Applebee Aviation, exposure to Velossa could cause severe damage to one’s vision and contact with 2,4-D can irritate the skin. Ivy’s employers did not inform him of this, and without knowing, he wore the same work clothes for three days before he realized what was causing the itching on his body. Applebee Aviation’s workers and the Seneca Jones foresters supervising the sprays didn’t raise concerns, either. The timber industry, their contractors and supervisors claim they adhere to the rules, and regulators are often not present during the sprays to say otherwise. By providing documentation, Ivy now has proof of the misconduct in an industry that is meant to be monitored by agriculture and forestry departments, but is often overlooked. Representatives of the industry have successfully stopped bills that outlaw spraying near homes and schools, working to keep control. The laws currently in place allow the companies to choose how and where the herbicides are sprayed. These weak regulations are meant to ensure the safety of more than 165 square miles of Oregon’s forest. 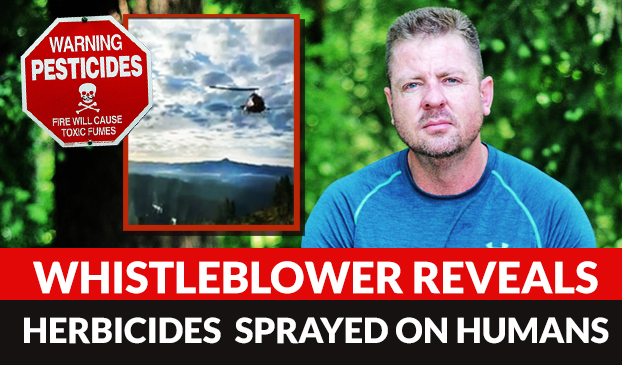 In Oregon, environmentalists and concerned citizens have attempted to draw attention to the need for tighter supervision in order to stop the poisoning of people, land and surrounding streams. Since his employment at Applebee Aviation, Ivy broke out in a rash on his upper body and frequently hacks up blood. Ivy has been diagnosed with “acute chemical exposure” and “acute contact dermatitis,” and is currently pursuing a worker’s comp claim. Ivy’s health and future, and the future of such a loosely regulated industry, remains to be seen. Happier Than a Pig in SH*T?